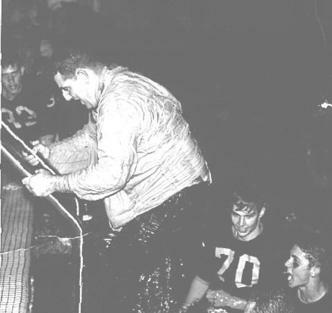 " In memory of a football coach named Art Haege "
Art Haege getting out of the pool after his 1968 Two River's Wisconsin High School football team celebrated winning the conference championship with a perfect 8 and 0 record and ranked #4 in the State, big school division. They didn't have State playoffs back then. 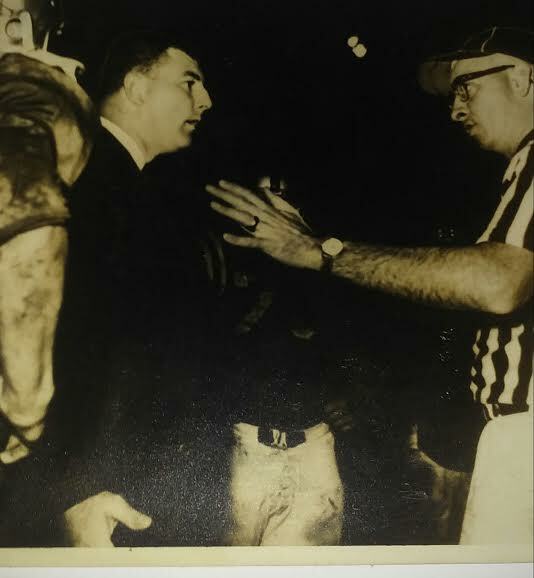 Art Haege when he was the Head Football Coach at Manistee High School in Manistee Michigan in 1965. Coach Haege had the reputation of making losing football programs into winning football programs every place that he coached. This includes winning conference championships at high school's and colleges in Michigan, Wisconsin, and Minnesota, Art Haege was the head football coach at seven different high schools in three different States. In his first nine years as a head high school coach at five different high schools in three different States Art Haege had a record of 58 wins,17 losses and 2 ties. Coach Haege was always very well liked by the students and players for his very disciplined style of coaching while at the same time having a great sense of humor that was often hidden under his strict style of coaching. Coach Haege believed that football was ultimately a simple game, and you win football games by teaching good fundamentals such as blocking and tackling. Coach Haege had a Pro mentality and he always coached like a Pro. When the other team was doing their "rah rah" chant before the game, Coach Haege would tell his teams to "listen to that" as his teams calmly walked onto the field. Coach Haege was a great motivator and he was at his best coaching when his team's were the underdog. Coach Haege's High School teams were not blessed with great talent. But Coach Haege could make almost any team into a winning team. Coach Haege believed in treating each player as a unique individual, and then the individuals form one team. You can't have a team by treating every player the same because they are not all the same. Coach Haege always wanted to be remembered as "The coach who wouldn't be coached." If you hired Coach Haege to be your football coach, it was his team. He once kicked a school board member out of his practice and said "this is my team." When Coach Haege was a Head High School and Community College Coach, he only had one or two assistants. Coach Haege was the Offensive Coordinator, Defensive Coordinator, and Special Teams Coordinator. Coach Haege was his team's strength coach. It was Coach Haege's team. Art Haege was born September 29th,1937 in Canton Illinois. He passed away on March 5th, 2007 from a rupture within the wall of his aortic artery at the age of 69. This site is dedicated to all of the hard work and sacrifice Coach Haege gave to the game of football. There was only one Art Haege. He was unique, and a "one of a kind" of Coach that only comes around once in a lifetime for his colorful and sometimes controversial ways and his ability to make losing teams into winning teams. He could have stayed at one high school his entire career and won several State Championships. But that was not Coach Haege's style. He enjoyed the challenge of making losing football teams into winning teams. As a newspaper article I have from the 1970's says "Art Haege; Builder of Winning Football Teams." 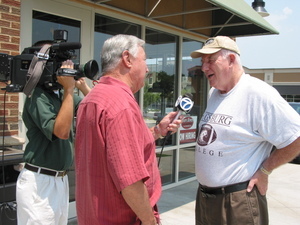 Art Haege being interviewed when he was the Defensive Coordinator for the Arkansas Twisters of the Arena Football League in 2006. I am sure he is telling one of his many football stories from back in the day. Here is Coach Art Haege's 1976 Virginia Minnesota team in the dark blue jerseys. Coach Haege is in the far right corner at the very start of the video wearing a dark blue sweatshirt with no hood. Later in the video you can see me standing next to him on the sidelines when I was a kid. I am wearing a grey hooded sweatshirt under my blue coat and shaking my hand in victory. This was not Coach Haege's best team with a record of 5 and 4. But as you can see, Coach Haege's teams always gave 110% effort every play. In this video watch Coach Haege's running back run over and knock out the other team's player on the goal line in one of the most brutal goal line knock outs I have ever seen! It's safe to say that Coach Haege had a good halftime talk with his team, when they were only leading 14 to 6. This video is the second half of their game. I chose the song for the video only because I like the song and it was free on YouTube. When I was a kid Coach Haege told me and my brother Frank on monthly basis, that if you kid's ever try a drug you are getting the hell out of the house! It worked, because my brother Frank and I have never even tried a drug. Drugs ruin lives,so don't take drugs!